(CNN) - Minnesota Rep. Michele Bachmann said Monday at the CNN debate that she had filed paperwork to enter the presidential race and said she plans to make a formal announcement of her candidacy "soon." 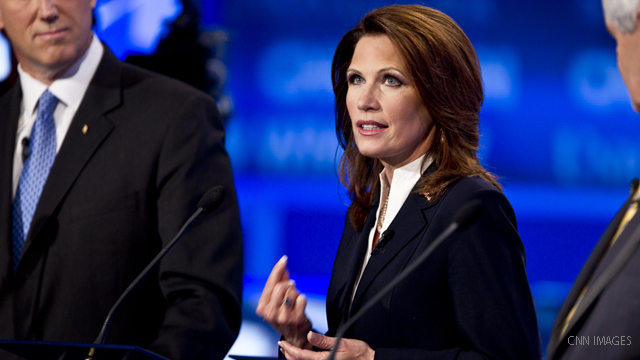 Bachmann is the only participant at Monday's debate who has not formally declared her candidacy. The three-term congresswoman is a darling of the tea party movement and a founding member of the 50-member House Tea Party Caucus. She flirted with a bid for the White House for much of the Spring and now plans to make an official announcement in her home state of Iowa this month. Bachmann and her husband, Marcus, are born-again Christians, and it was God, she says, who encouraged her to run for higher office. She has since become a champion of conservative values, particularly the vision that government should be limited to only what is in the Constitution. Term Limits? That would never pass...if it were up to them life terms would be passed. Look @ all the benefits they gain when in office, then they forget where they come from and who they "serve"
Without mentioning Obama, can the candidates be specific in telling the American people how they will create jobs? Look at her voting record people. She votes the standard republican party vote on every bill. She is precisely the same as every other republican candidate. Just another washington clone. The US has the highest corporate tax rate in the world. Just like you, they try to find deductions they can take to lower their taxes. Who can blame them? I'd rather give money to a charity of my choice (tax deduction) then pay it to the IRS only to have my elected officials blow it on programs I don't believe in, etc. Somebody please tell me ONE instance where tax cuts helped the economy! Bush Jr.'s tax cuts didn't prevent the greatest recession in memory. Reagan's tax cuts caused not just one but TWO recessions! Tax cuts are just a lie. They never worked. Rich people didn't create jobs. They just used the money to speculate stocks, cause bubbles, lay off even more workers, and then demand the middle class bail them out with THEIR taxes. But of course, tax cuts for the rich are more important than helping grandma from becoming destitute by crippling health costs. tax breaks to the top rich and corporations, only gives larger bank accounts, since the congressional change over GOP has claimed to promote job growth and yet NOTHING has been done to Keep That Promise to America. Republicans want for themselves and enslave the middle class. Can't wait til oil is no longer needed, maybe get a Republican to cut my grass or wash my clothes for cheap labor! Like it or not, attractiveness sells (including elections) and....well... she's no Palin! She kind of looks like Katie Couric. Not good. I live in Bachmann's hometown of Stillwater MN. She is completely NUTS! Most of us are ashamed of her. Please focus your attention on other candidates, she doesn't deserve any more time in the spotlight. Cheers. Anytime a politician says God encouraged them to do something that pretty much tells me everything I need to know about their competency. Jon my man, I cant agree w/you more. it should be looked at. we spend so much on nothing. and poeple in our own backyard go to bed. HURRY! Coming from an open-minded conservative (regardless of how the press paints us, we do exist), we truly do need an overhaul of our educational system. Bush's "NCLB" was a bust. Well intended, but a bust nonetheless. We need to find a way to keep kids in school. Not just public schoolers, but silver-spooners who are lacking the same motivation. We need to inform the younger generations that every news outlet has a political agenda and help them think for themselves. This is a daunting task and only a handful of elected officials are trying to do something about it. Her coming has been foretold since the battle of Concord, New Hampshire. Is there a necessity for continuing our current policy of allowing private banks to issue our currency as debt? So far women in politics have not shown the deviant behavior that men have. Only a matter of time of course. It will be great entertainment when discovered.